A calming portrait in ivory. Majestic calla lilies and stately white roses are framed by the lush leaves of aspidistra and calathea. Soft green sword fern adds to the soothing tones. 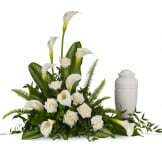 A serene way to share your thoughts of love and sympathy. Urn is not included. • Large white calla lilies pair with white roses and lush greens that include soft, airy sword fern and glossy aspidistra. 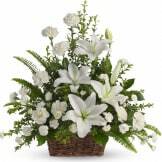 • Arrangement measures approximately 41" W X 31" H.
Flowers will be received by a Buchholz Mortuaries, Inc's staff. 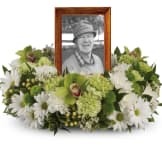 All of our flowers are designed and delivered by hand from a local florist in in Chesterfield.